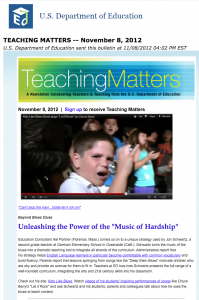 Jon Schwartz, a second grade teacher in California, turns the music of the blues into a thematic teaching tool to integrate all strands of the curriculum. Administrators report that his strategy helps English Language learners in particular become comfortable with common vocabulary and build fluency. Parents report that lessons springing from songs like the “Deep Elem Blues” motivate children who are shy and provide an avenue for them to fit in. Teachers at ED love how Schwartz presents the full range of a well-rounded curriculum, integrating the arts and 21st century skills into his classroom.